This body of work comprises pieces based on stained glass windows and studies by Jean-Auguste-Dominique Ingres (French, 1780-1867). Produced by artisan stained glass manufacturers in the Czech Republic, these pieces feature contemporary subjects set against ornate and extravagant backgrounds traditionally reserved for religious contemplation. 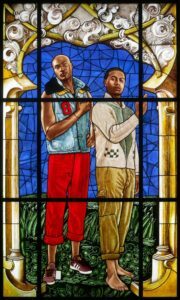 Los Angeles native and New York based visual artist, Kehinde Wiley has firmly situated himself within art history’s portrait painting tradition. 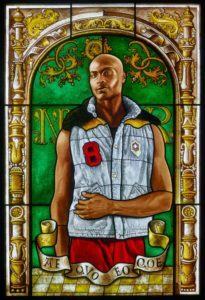 As a contemporary descendent of a long line of portraitists, including Reynolds, Gainsborough, Titian, Ingres, among others, Wiley, engages the signs and visual rhetoric of the heroic, powerful, majestic and the sublime in his representation of urban, black and brown men found throughout the world. By applying the visual vocabulary and conventions of glorification, history, wealth and prestige to the subject matter drawn from the urban fabric, the subjects and stylistic references for his paintings are juxtaposed inversions of each other, forcing ambiguity and provocative perplexity to pervade his imagery.